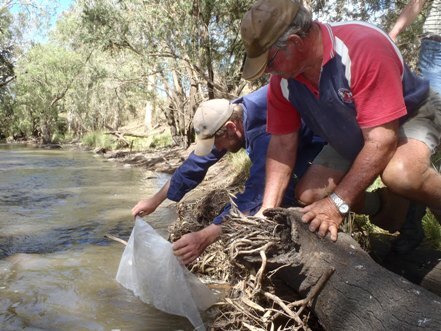 As part of a long term strategy for Oakey Creek catchment area, Condamine Alliance released fish into the waterways at Kerwee as part of their replenishment program. Kerwee Feedlot, in conjunction with Condamine Alliance, is committed to the preservation of natural flora and fauna in the catchment area; traditionally cattle have fed and drunk along the water’s edge, however new watering points established away from the riverside will significantly contribute to the natural replenishment of native grasses and wildlife. The release of Murray Cod fingerlings, a species of fish native to the area, demonstrates Kerwee’s commitment to the environment; and that our feedlot can exist alongside the native wildlife and vegetation. Brad Robinson, General Manager of Kerwee Feedlot said that “A good business can operate successfully without impacting on creek biodiversity, and has the ability to actually improve the waterway”.